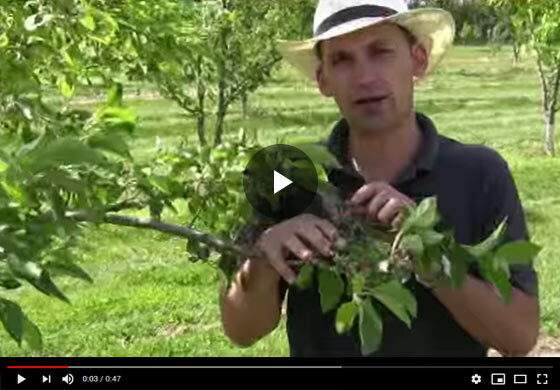 Join Gurney's horticulture expert as he demonstrates how to thin an apple tree. Find out how to identify what to remove and how to balance out the tree in order to grow the biggest, sweetest fruit. Hi everyone, Felix here with Gurney's and today I'm talking about apple fruit thinning and if you really want some big size, and you want to limit your chances of having limbs break on your apple tree when these fruit size up and your crop loads too much for your limb to handle, thinning is the key. Here is a cluster where we have some nice set right in front of me, you can see there are four fruit that have set on this. There was probably another flower here that didn't get pollinated and fell off, so we have four fruit and you can see the varying size. The one in the middle, usually called the king fruit is the one, it's the flower that opens first and it's going to get pollinated first. so it's going to get a jump on its siblings next to it and we want the biggest fruit so we're going to pull off the siblings next door and just leave one fruit per cluster. And if there's anything that you do folks, it's thinning down at least to one fruit for cluster and a lot of times you can take the fruit clusters off the bottom of your limb that aren't going to get the sun, they're not going to get that sweet but at least take them down to one fruit per cluster and try to leave the biggest fruit which is usually your king fruit.